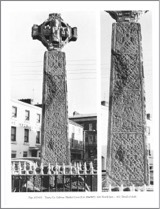 This page contains information on the High Crosses of County Galway. 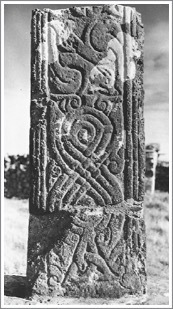 They include: Addergoole; two cross-shafts and a cross-head at Killeany/Teaglach Einne; three cross fragments at Temple Brecan; and a Cross-head, fragmentary cross-head and cross-shaft at Tuam, and several crosses and cross fragments on St. Macdara’s Island. 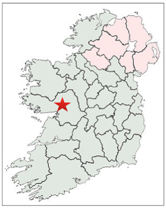 The location of County Galway is marked by the star on the map to the right. A cross-head is all that we have of what could have been a very large cross. The cross-head measures 55 inches in height and 50 inches across the arms. It is 15 inches thick. It is located in the Addergoole or Carrowntomash graveyard near Dunmore to the north northeast of Tuam. The cross is unfinished, the east face (against the wall) having no decoration. The west face has an unfinished crucifixion scene. The carving is irregular in shape. The photo to the right is from Harbison, 1992, Vol. 2, Fig. 4. See the Road Atlas page 24 E 5. Located north of Tuam between the N17 and N83 and south of the R328, just south of Garrafrauns. Killeany is located near the east end of the island of Aran Mor. It was established about 485 by St. Enda, and may have been the first Irish monastery. Life at Killeany was rigorous. The monks lived in stone cells, slept on the ground, ate together in silence and conducted farming and fishing. It is said that Enda would not allow a fire to be lit in the monastery, so conditions must have been very cold much of the year. In the photo to the left we see the stump of a round tower and the shape of Temple Benan atop the ridge. In the 1650’s The stone of most of the monastic buildings was taken by Cromwell’s men and used to build a fortifications. At the time of the Cromwellian destruction there were remains of six churches. Those destroyed were Kill Enda, Teampall MacLonga, Teampall Mic Canonn and St. Mary’s church. The latter may have been part of a Franciscan friary that once stood there. The buildings remaining are Temple Benan and Tighlagheany. Both of them were at some distance from the location where the fortification was built. 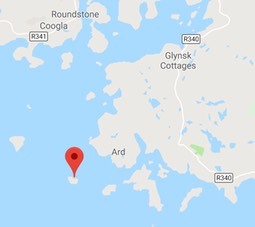 (Manning, p. 96) While most of the monastery was sheltered from the worst of the wind and weather by the higher elevations of the island to the north and west, Temple Benan sits atop a limestone ridge above the harbor of Killeany. In the course of time he returned to Ireland and established a church at Drogheda. Through another sister, Darina, he had Aonghus, King of Cashel as a brother-in-law. Through this connection he gained Aran Mor as a place to found a monastery. He arrived there about 485 with about 150 followers and established what is remembered as the first monastery in Ireland. St. Enda died in about 530. The cross shaft and base are located just below the remains of the round tower. The base is square and has a meander design on the south side. E 2: An equal armed cross divides the panel into four parts. In each is an animal contorted into a spiral shape. E 3: Four squares of fretwork form a St. Andrew’s cross in the center. E 4: Three pointed knots of interlace. Bottom: A half-palmette emerges from a spiral. W 2: Two animals, back to back, have open jaws. W 3: There is a very small indication of pointed interlace. Bottom: Half-palmettes emerge from spirals. Top: The decoration is unclear. There are 3 fragments that have been placed together against a wall in Temple Enda. See the photo to the left. Bottom: Pointed interlace is topped with a chain of interlace. This piece is displayed upside down and would have been located just above a crucifixion scene on the head as the very top of Jesus’ head is visible at the top of the fragment as it now stands. 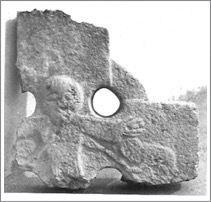 Middle: This fragment has a hooded horseman and above that a chain of interlace. This piece would originally have been just below the crucifixion scene on the head as the feet of Jesus are just visible at the top of the fragment as it now stands. Top: A marigold pattern in a circle is above a partial field of irregular interlace. Bottom: This piece is displayed upside down but is shown in its proper orientation in the photo to the right is from Harbison, 1992, Vol. 2, Fig. 424. There is pointed interlace at the top and “below it, the segment of a circle composed of interlocking T-shapes.” (Harbison 1992, p. 127) At the very bottom is what appears to be the top of a head. Middle: The lower portion of a figure in a long robe stands on a segment of pointed interlace. (Harbison, 1992, Vol. 2, Fig. 426. Top: The lower portion of the panel has four fretwork patterns that seem to form a St. Andrew’s Cross. Middle and Top: Spiral and half-palmetto shapes. 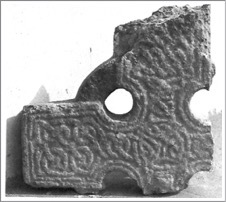 This cross fragment was discovered during an archaeological excavation published in 1985 by Conleth Manning. (See Manning, pp. 118-119) The fragment consists of the upper arm, the central portion of the head and one arm. It measures .52m across by .50m high and .11m thick. 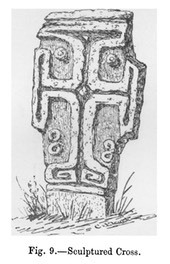 The sides of the fragment and the end of the arm are undecorated.The illustration below right is from Harbison, 1992, Vol. 2, Fig. 423. 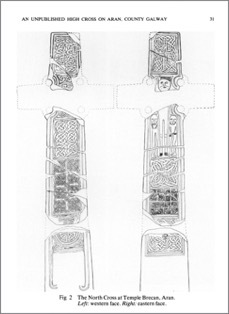 It illustrates how the cross shaft and three fragments in Temple Enda may have formed one complete cross. 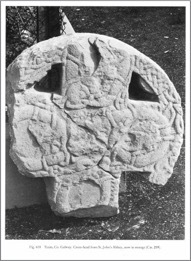 The cross-head found near Temple Enda was clearly from a second cross. The Aran Islands are accessible by ferry. 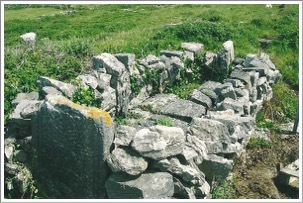 Killeany (Teaglach Einne) is located on Aran Mor, the largest of the Aran Islands. 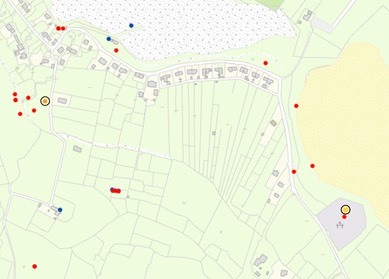 The site of the crosses described above is on the east end of the island, near the air field. 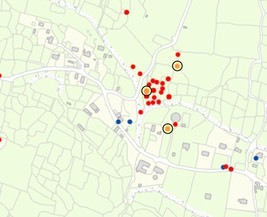 The map marks the two locations with the large yellow and red circles. The map is cropped from the Historic Environment Viewer. 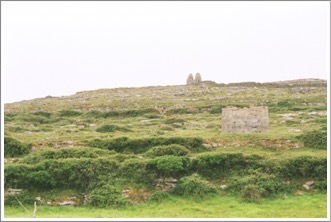 Manning, Conleth, “Archaeological Excavations at Two Church Sites on Inishmore, Aran Islands”, The Journal of the royal Society of Antiquaries of Ireland, Vol. 115 (1985), pp. 96-120. O’Maoildhia, Dara, Pocket Guide to Arainn: Legends in the Landscape, Aisling Arann, 1998. E 1: Interlace with a triskele in the center circle. W 1: Circular interlace with triangular interlace in the four corners. The sides have no decoration. The illustration above right from Waddell, p. 30. The fragments of this cross have been cemented on a platform, leaving only one side visible. 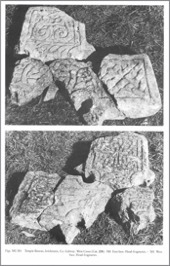 The photo below left and the illustration below right are both from Harbison, 1992, Vol. 2, Figs 575 and 576. The illustration was made by Westropp. Head: Interlace forms four circular forms. Arms: Two-strand interlace around a boss. Above and below the head and on the upper panel there is fretwork. 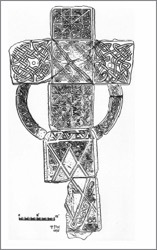 Shaft: Westropp identified a crucifixion surrounded by ornament. This was no longer visible in the 1990’s. Ring: The fragment of ring present has interlace. 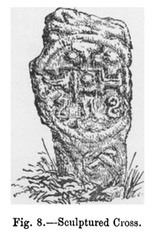 The remains of this cross consist of a partial shaft and a number of head fragments that are located nearby. The photo to the right is from Harbison 1992, Vol. 2, Fig. 580. 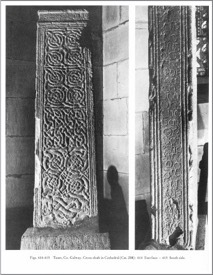 The west face of the fragments is pictured above and the east face below. E 1: Four fret patterns form a St. Andrew’s Cross. E 2: Four interlinked and circular interlace designs. E 3: Two knots of pointed interlace. E 4: Same as E 2. Head: Circular interlace in the center. Interlace on the surviving arm. W 2: Thick band of interlace. W 3: Crucifixion scene with figures beside Jesus’ legs and under his arms. The illustration to the left is from Harbison, 1992, Vol. 2, Fig. 579 and was drawn by Waddell. The details of the crucifixion scene as shown in the illustration are much clearer than on the shaft, at least in the photos above. The Aran Islands are accessible by ferry. Temple Brecan is located at the west end of the island in an area also known as Seven Churches. The locations of the three main crosses are indicated on the map by the yellow red circles. 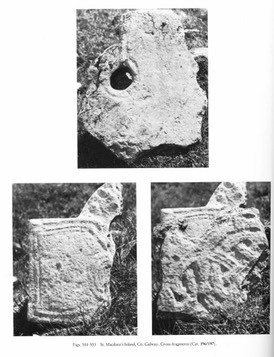 Waddell, John, “An archaeological Survey of Temple Brecan, Aran”, Journal of the Galway Archaeological and Historical Society, Vol. 33 (1972/1973), pp. 5-27. 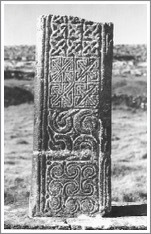 Waddell, John, “An Unpublished High Cross on Aran, County Galway”, The Journal of the royal Society of Antiquaries of Ireland, Vol. 111, (1981), pp. 29-35. 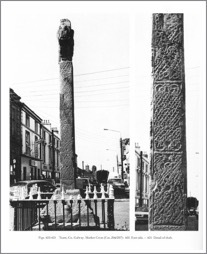 Jarlath (also known as larlaithe mac Loga) was born of a prominent family in Connaught about 445 and died about 540. He is supposed to have studied under St. Benign (Benin) of Kilbannon, a disciple of St. Patrick. Later, he founded a monastery at Cluainfois (Cloonfush). He left Cloonfush around 495 to study with St. Enda of Aran. He returned, probably initially to Cloonfush, in the 520’s. Then, according to the story related above, he settled at Tuam where he founded a school and monastery. This cross is a composite formed by pieces of two different crosses. The base and shaft are from one cross and the head is from another. The base is just over 2 feet in height. The shaft stands nearly 9 and one half feet and the head is about 3 and one half feet in height and a little wider across the arms than it is tall. Except where noted the descriptions below follow Harbison, 1992, pp. 175-176. Photographs are also from Harbison, 1992, Vol. 2. Head: The underside of the ring has two panels of interlace flanking a panel of interlaced animal. The end of the arm has a figure in high relief. Base: There is an inscription on the plinth that reads: “Prayer for Turlough O’Connor for the . . . of Iarlath by whom was made” (Harbison, 1992, p. 175; photo Vol. 2, Fig. 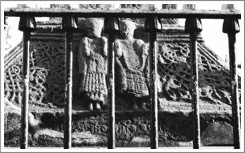 603) On the main face are two clerics in high relief. Urnes style animal interlaced flank the two clerics. Head: The Crucifixion shows Jesus against a cross with bosses above and below his hands. He appears to wear a crown. There is zigzag ornament beneath Jesus’ arms. Above Jesus’ head are two figures. Base: There is no inscription on the plinth and the main panels have animal ornament. Head: Under the ring a central panel of interlace is flanked by arches. Under the arm is a cheque pattern. The end of the arm has a bishop or abbot with a crozier who may be flanked by smaller figures. Base: On the plinth is an inscription that seems to read: “Prayer for O Hossin, for the Abbot, by whom was made”. (Harbison 1992, p. 176, photo Vol. 2, Fig. 607) Urnes style decoration is on the panel above. Shaft: There are 4 panels. The lower one contains interlace, the other 3 have Urnes style interlace. 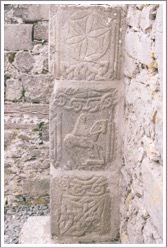 The upper panel has animals arranged in the form of a cross. There is a square hole in the center. Ring: There is moulding that encloses an undecorated panel. The moulding on the inner side terminates in animal heads. This shaft was found beneath the communion table and has since been erected in the cathedral. It stands just under 5 feet in height. The panels are not separated by framing. E 2: Animal interlace forming four spirals. E 3: Interlace forming four circular shapes. E 4 and 5: Similar to E 3. 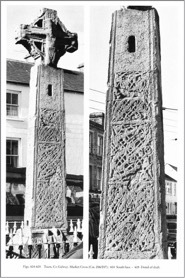 Based on the evidence above for the dating of the Market Cross, this cross must be essentially contemporaneous, dating to between 1128 and 1156. W 1: Interlace for four circular shapes. W 2: Four squares of fretwork. W 3: Interlaced animals form a figure eight with an additional animal coiling around them. An inscription fills this side of the cross. It reads: Prayer for the successor of Iarlath, for Aed O Hossin who had this cross made. Like the inscription on the Market Cross this inscription supports the conclusion that this shaft is contemporaneous with the Market cross. Because it does not give O Hossin a table, the shaft could be a few years later than the Market cross as O Hossin became Archbishop in 1150. Getting There: See the Road Atlas page 32 E 1. 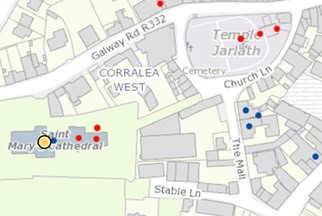 The crosses are located in St. Mary’s Cathedral in Tuam. 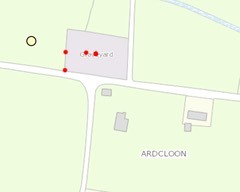 The site is indicated by the yellow circle on the left-hand side of the map. Kelly, Richard J., “Antiquities of Tuam and District”, The Journal of the Royal Society of Antiquaries of Ireland, Fifth Series, Vol. 34, No. 3, [Fifth Series, Vol. 14] (Sep. 30, 1904), pp. 357-260. 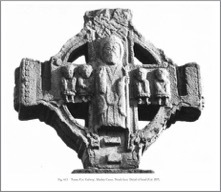 Petrie, George, “On the Stone Cross of Tuam”, Proceedings of the Royal Irish Academy (1836-1869), Vol. 5 (1850-1853), pp. 470-474. 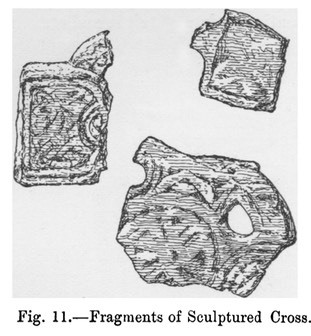 There are three crosses on the island with numerous fragments that have yielded another cross shaft and three fragments of a cross head, making a total of five crosses. Each of these crosses is described and pictured below. 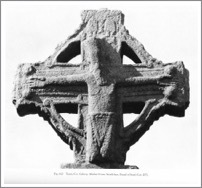 The second cross, pictured to the left, has what Bigger described as serpents in the two lower segments of the head of the cross. It measures 30 inches high, 17 inches wide and 4 inches thick. (Bigger, Fig. 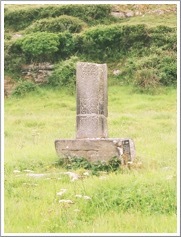 8) Crawford describes it as follows: “A plain limestone cross . . . with solid disk.” (Crawford, p. 211) Apart from the serpents, neither Bigger nor Crawford describe the rest of the carving on the cross. 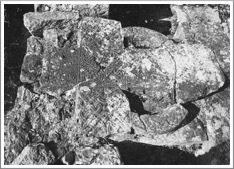 From the photo to the right it appears there is a crudely carved cross that occupies a raised circle around the head of the cross. In the center of the cross there is a boxlike figure with a raised boss in the center. This cross and the next are located south of the church. 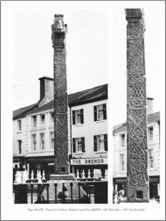 This cross, pictured to the right measures 33 inches in height and 17 inches wide. 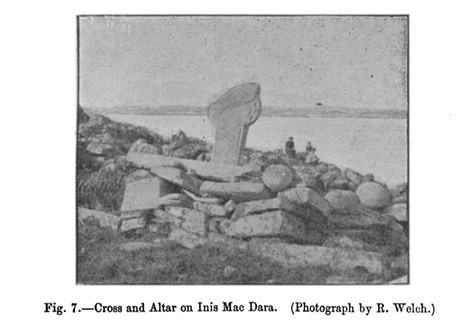 Crawford describes it as “A granite cross, 2 feet 9 inches above the ground (part being buried), with solid disk; carved with a double-lined cross in relief, and bosses on the east side and with circles, bosses, etc., on the west side.” (Crawford, p. 212) The arm to the right in the photo has the appearance of a rudimentary arm, extending slightly from the main body of the cross. The base tapers on both sides as it moves toward the base. Bigger identified several fragments of a cross that, when placed together, formed the central shaft of a cross. This cross, pictured to the left, was 7 feet 6 inches tall and 10 inches wide. Based on the illustration to the right it was composed of five separate fragments. The illustration also suggests, based on what was present, what the cross may have looked like in its original form. See Road Atlas page 29 D 3-4. The island is located southwest of Carna and can be reached only by boat. The map is cropped from Google Maps. Bigger, Francis Joseph, “Cruach Mac Dara, off the Coast of Connamara: With a Notice of Its Church, Crosses, and Antiquities,” The Journal of the Royal Society of Antiquaries of Ireland, Fifth Series, Vol. 6, No. 2 (Jul., 1896), pp. 101-112. 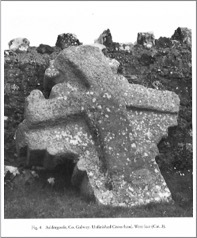 Crawford, Henry S., “A Descriptive List of the Early Irish Crosses,” The Journal of the Royal Society of Antiquaries of Ireland, Fifth Series, Vol. 17, Dublin, 1907.